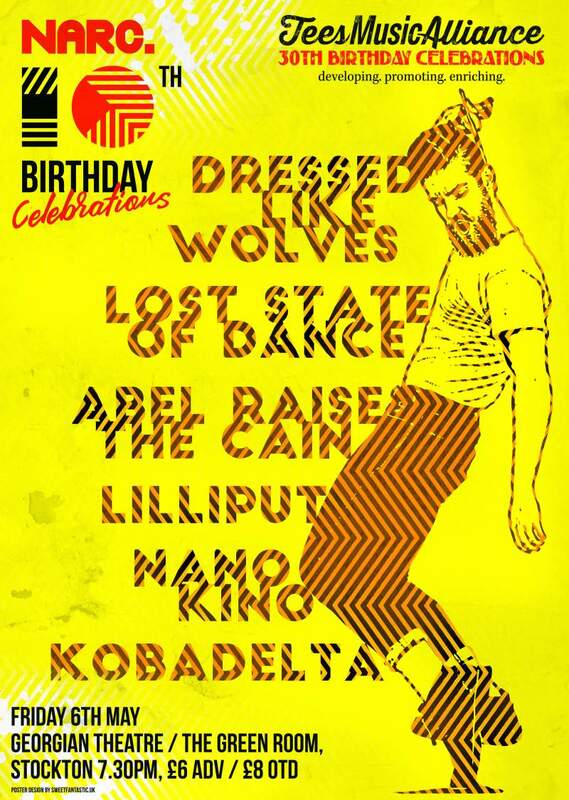 Because we’re just not satisfied enough with the four birthday parties we’ve already had (we didn’t get enough presents), we thought we’d team up with our friends and Teesside music charity Tees Music Alliance for another bash! They celebrate an astonishing 30 years of promoting live music in the region, and they’ve managed the Georgian Theatre since 1993. The building itself celebrates an even more impressive milestone this year, turning 250! With so many high points to celebrate, it seems fitting that a massive party is planned. Six bands will take over both The Georgian Theatre and The Green Room in Stockton to provide some beautiful sounds to serenade our celebrations. At the Georgian, indie rock is the order of the day from Teessiders Abel Raise The Cain, whose atmospheric soundscapes and epic sonic arrangements make them a truly spectacular live band; Newcastle-based wild rockers Kobadelta bring a psych-tinged sound to their dark indie style – expect to throw some shapes while staring moodily into the distance; while Sunderland’s Lilliput demonstrate everything that’s right about indie pop – lush harmonies, superb songwriting and a mesmerising live show that’s full of baroque drama and sweeping majesty. Performing at The Green Room, and launching their brand new Surfing On The Void EP on the same night, Nano Kino present their passionate, ethereal and instant experimental pop; Teesside stalwart Rick Dobbing’s epic Dressed Like Wolves offer a masterclass in lo-fi folk, replete with heart-torn-out lyrics and a Conor Oberst-style vocal which leaves every audience breathless, and Hartlepool quartet Lost State Of Dance’s prog-infused electro will bring the synth-drenched dancing to the party! With timings staggered so you can see as much as possible, and tickets at a mere £6 in advance, you’d be frankly bonkers to miss out. Bring your party hat! Abel Raise The Cain, Kobadelta, Lilliput, Nano Kino, Dressed Like Wolves and Lost State of Dance play The Georgian Theatre and The Green Room, Stockton on Friday 6th May.